During the 60s, 70s, 80s and 90s Ellis labored in the vineyard of North Carolina politics to weld the state’s conservatively inclined voters into one of the county’s most formidable Republican organizations. In the process “Mr. 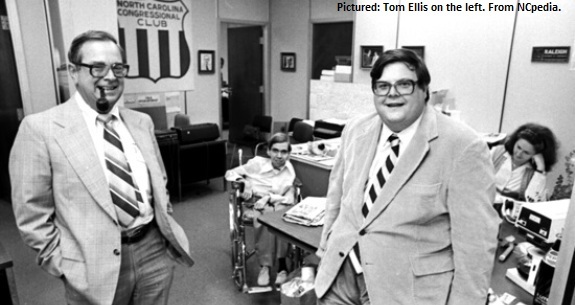 Ellis” as he was known to the many up and coming conservatives he mentored, and whose careers he advanced, made history. Tom Ellis was one of the first political strategists to recognize the unharnessed political potential of Evangelical Christians, but when I say he “made history” I’m not just referring to Ellis’ contribution to the election and reelections of Senator Jesse Helms or the election of such conservative stars as Senators John East and Lauch Faircloth, but to the salvation of Ronald Reagan’s political career. In 1976, when Ronald Reagan launched his campaign against incumbent Republican President Jerry Ford, the calendar was somewhat unfavorable to his conservative candidacy and going into the North Carolina primary Reagan had yet to win a state. Ellis, with the support of Senator Helms, more or less kicked the Reagan campaign staff out of North Carolina, took over Reagan’s campaign in the state and told Reagan stay out of North Carolina unless he would do four things; attack President Ford; attack Henry Kissinger; attack the giveaway of the Panama Canal, and attack détente. There was immense pressure for Reagan to drop out going into North Carolina. However, Reagan agreed to do what Ellis asked and attacked Ford and Kissinger and their weak foreign policy; he won the North Carolina Republican primary in an upset and kept his campaign alive. Had Reagan not won in North Carolina, the next primary up was Texas, a very, very distant five weeks away. It is doubtful Reagan would have had the money to compete for five more weeks without a win in North Carolina. Had Reagan been forced to drop out without taking his campaign all the way to the convention in 1976 it is doubtful he would have been a viable candidate in 1980. So, Tom Ellis in a very real sense was responsible for saving Ronald Reagan’s political career, and the Reagan Revolution. I first met Tom Ellis through my work for Senator Jesse Helms and his Congressional Club. Ellis approached me about having the Viguerie Company conduct a direct mail campaign to retire Senator Helms’ 1972 campaign debt of $90,000. Given today’s multimillion dollar campaigns that seems like peanuts today, but in the early 1970s $90,000 was a lot of money. We were able to not only quickly retire the debt, but put another $30,000 in the Senator’s campaign account, and thereby convince Ellis and Helms of the power of direct mail. After that we helped them take the Congressional Club national, turning it into the National Congressional Club, and in the process making Senator Helms one of the most well-known elected officials in the country, and one of the leaders of the growing national conservative movement. Under the leadership of Tom Ellis, the National Congressional Club eventually grew to have about 250,000 donors who regularly received mailings from Senator Helms telling them what was really going on in Washington and exhorting them to support conservatives, especially for Congress. As an aside, it is worth noting that in the days before Rush Limbaugh, FOX News and the internet direct mail was the way conservatives bypassed the liberal media filter and got their message out. It was no coincidence that the most popular conservatives of that era, Ronald Reagan, Jesse Helms and Congressman Phil Crane, signed the most direct mail and all had formidable direct mail operations. Through the establishment of the National Congressional Club Tom Ellis became very involved in conservative politics at the national level, but he always preferred to stay in the background, making his mark through the people he helped to elect and the conservative policies they advanced. In addition to our shared commitment to conservatism, Tom Ellis and I shared a love of golf, and in the rounds we played together I found him to be not just a shrewd political strategist, but a fierce ideological conservative, who was just as fed-up with the weak kneed Republican establishment as I was. While Ellis and Helms were the fathers of the modern Republican Party in North Carolina, they were first and foremost conservatives, and they were not bashful about holding the feet of so-called moderates to the fire. And in his fierce ideological conservativism Tom Ellis was in many ways “Trump before Trump.” He was unapologetic about wanting to win and was prepared to fiercely attack opponents, Democrat or Republican, to save the country from the rapid slide to socialism that he saw threatening the liberty of the working folks of North Carolina and the rest of America. Tom Ellis was one of the handful of wise leaders who helped build the Reagan coalition, and he joins such luminaries as Phyllis Schlafly, Jesse Helms, Paul Weyrich, Lyn Nofziger, Jeff Bell, Joe Coors, Howard Phillips, Judge William Clark, Terry Dolan and Jerry Falwell in the pantheon of those who have left us, but whose foresight saved America by electing Ronald Reagan President and building the national conservative movement that we know today.